Before Chris Herren’s presentation last Wednesday, Veritas editor, Leah O’Bryan was able to ask him some questions about his life and his message for Rockland High School students. Following is the interview taped by WRPS staff. Herren interview from David Cable-Murphy on Vimeo. Chris Herren spoke for over an hour to RHS students on Wednesday about the substance abuse that nearly cost him his life. The details of Herren’s 14 year battle with cocaine, oxycontin and heroin addiction held the attention of the high school students who packed the RHS theater during periods 6 and 7. The Veritas will report on the presentation and student reaction in the October issue, due out on October 11th. Prior to the assembly, Herren sat down with Veritas editor, Leah O’Bryan. The tape of her interview will be shown on this website. Students prepared for Chris Herren’s presentation which kicked off Rockland Cares’ Week of Hope by wearing purple in support of Project Purple to stand up to substance abuse. RHS seniors, Mikaela Dion, Kayla Meech, Tyler Lewis, Macayla Sheehan and Molly Hurley attended the presentation by Chris Herren on Wednesday, September 26th. Mrs. Borden has announced that it is time, once again, for sophomores to take advantage of an opportunity to participate in job shadowing. Job shadowing is a program that is open to sophomores to explore a field or occupation of interest to them. The job, field or business that a sophomore may choose to investigate is one that is already available through the Guidance Department, or it could be one that the student finds on his or her own. So, if, for example, you are interested in the medical field, you could see if guidance had an opportunity in that field; or you could contact someone that you know in that field and see if you could visit it for a day. The Job Shadowing days this year are scheduled for October 24th and 25th. Sophomores should see Mrs. Borden in Guidance on any Wednesday or Thursday. The deadline to apply is October 10th. Yearbook to include underclassmen pictures? The Yearbook Staff met with a representative of Jostens’ Publishing Company to hear about the idea of including all underclassmen’s pictures in the yearbook of the Class of 2013. The idea was proposed as a way, not only to include all students at Rockland High in the yearbook, but also to decrease the overall cost of the yearbook for seniors. The cost of the yearbook has risen over the years and costs over $100. The Jostens representative admitted that the adding of underclassmen might not give a huge boost to sales, especially right away. The main benefit, she said, is to make the yearbook more of a historical document that accurately represents the overall make-up of the school. However, it would decrease the cost even with the addition of 30 to 40 students and parents who would buy the yearbook if underclassmen pictures were in it. Yearbooks from East Bridgewater and a few other surrounding towns were shown to the Yearbook staff who liked the ones with just a few extra pages with the underclassmen pictures. Team and club photos with underclassmen have always been included in RHS yearbooks. The staff will be voting on this proposal next week, so stay tuned. “Let’s Get Angsty” on stage Friday and Saturday! Playing the leading role of Bobby is RHS senior, Chris Carchedi. or at the door for $5.00. 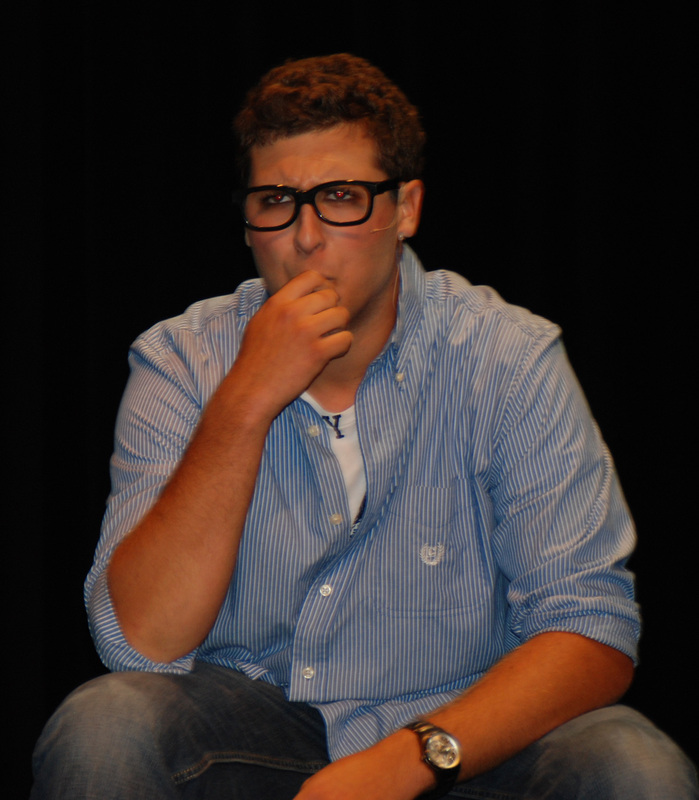 The show has many funny moments and the acting is superb with senior Chris Carchedi in the leading role of Bobby who writes a play called “Something Fishy” to win back his former girlfriend (Bailey Olsen). The play parodies many aspects of society, high school life and teenage angst and the humor is both subtle and obvious (and hilarious). You don’t want to miss this original work by the talented Mr. Palana. Please help with a donation or come walk with us! The walk is Sunday, October 14, 2012, starting at the DCR Hatch Memorial Shell in Boston at 8:00a.m. Each year, for the past eight years the students at Rockland High School have participated in the Breast Cancer Walk in Boston. It all started with the Rockland High School Girls Soccer Team in 2004 that had two mothers diagnosed with Breast Cancer. The team wanted to pay tribute to them and decided to participate in the walk. Since then the walk has expanded beyond the soccer team at RHS, welcoming the Rockland High School Volleyball League, Student Government Council, and even the public to come along and walk for a good cause. Through this students have raised thousand of dollars for the cause. Many people have asked if the high school has an online account so they could donate to the cause in our name. Well this year we do! The goal this year is $5,000! You can talk to Mrs. Ryan, RHS school nurse with any questions. Thanks again for all the community support we have had in the past. No School on September 28th! Rockland High School students along with all the school children of Rockland will have a full day off on September 28th! This day is for teacher professional development. It is a day off that was not on the original calendar and seniors are especially looking forward to taking the day to sleep in, relax or get a head start on the weekend after a month of school. Maybe they will even work on their college applications!